Sydney Camm, one of Britain's most distinguished aircraft designers, was born in 1893. 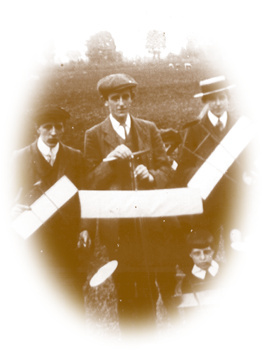 From his schooldays he had shown a keen interest in aviation, founding the Windsor Model Aeroplane Club and constructing many successful model aircraft. As a child he lived at No. 10 Alma Road, with his siblings one of whom was Fred Camm who was to become editor of the famous 'Practical...' series of magazines. Sydney Camm was a pupil at The Royal Free School, Bachelors Acre, leaving at the age of 14 in 1908. Camm's father, was an excellent carpenter and joiner and must have instilled in Sydney an interest in hand work, accuracy and quality. He used to spend hours whittling propellers for model aeroplanes. The brothers became sufficiently competent in building reliable model aeroplanes that they supplied Herberts' Eton High Street shop. Their models of biplanes and monoplanes were advertised as "Will Really Fly", and "Will Rise from the Ground". They found that a better price could be obtained by direct sales to the Eton College boys - these had to be delivered, at night, via a string lowered from the Eton boys' dormitories to avoid attracting the attention of the school authorities - and by Herbert's who were not amused to find out what was happening. 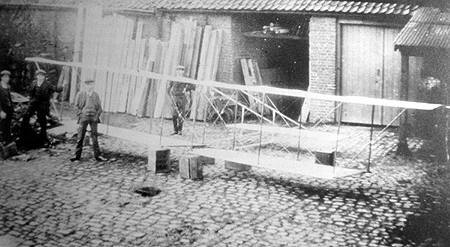 Sydney Camm and his friends built a full sized glider with plans to put an engine on it, seen here in the former Borough depot, Alma Road, circa 1912. 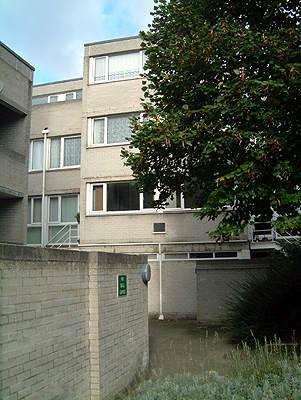 The building abutted the Borough Engineer's office, on the north side, with access from Arthur Road. There are said to be photos in the archives formerly held at Kipling Building and now believed to be held in the Borough Collection, Tinkers Lane. and built his first powered aircraft in 1911-1913. In 1914 Sydney Camm joined Martinsydes of Brooklands as a woodworker and was fortunate to come under the influence of G H Handasyde, one of the leading aircraft designers of the day. He assisted Handasyde with design work until, in 1923, he joined the Hawker Engineering Company, successor to the Sopwith Aviation Company Ltd, as a senior draughtsman. Within two years Camm had been appointed Chief Designer. He was to remain with Hawkers for forty-three years until his death in 1966. Camm's remarkable series of successful aircraft designs range from his Hawker Cygnet biplane of 1924 to the VTOL P1127 of 1960 and included such immortals as the Hart and the Hurricane. The beautiful little Cygnet weighed only 375 lb and was the Hawker entry for the Air Ministry Light Aeroplane Competition at Lympne in 1924. In 1925, with Fred Sigrist, Hawker's Managing Director, Camm developed the distinctive Hawker metal construction, using cheaper and simpler jointed tubes, rather than the alternative welded structure. In the late 20s and early 30s Camm designed the classic Hart family of fabric and metal biplanes. The Hart's success put Hawker in the front line of aircraft manufacturers and its design was used by Camm as a basis for aircraft to meet other requirements. These included the Demon fighter, the Hart trainer, the Audax army co-operation aircraft, the Hind, the Fury, the Osprey and the Nimrod Fleet Air Arm machines. This new generation of aircraft boasted performance far in advance of their contemporaries. At one time in the 1930s no fewer than 84 per cent of the aircraft in the RAF were of Hawker/Camm design. Official prejudice had for many years precluded the adoption of monoplanes by the RAF, but Camm managed to overcome the Air Ministry's apprehension with his superbly designed Hurricane. This, Camm's most famous aircraft, was based on the Fury. Together with Mitchell's Spitfire, it played a leading role in the Battle of Britain, the Hurricane shooting down more enemy aircraft than all other British aircraft and ground forces combined. Almost as celebrated were Camm's high-performance, piston-engined, Typhoon, Tempest and Sea Fury aeroplanes. After the Second World War Hawkers did not rush into the new field of jet propulsion but, as always at the propitious time, they brought out the Sea Hawk and swept-wing Hunter jet fighters, both designed under the direction of Camm. The Hunter, one of the longest lived jet fighters and ground attack aircraft, first flew in 1951. Towards the end of his career Sydney Camm was closely associated with the very advanced concept of vertical take-off and landing. The P1127, a forbear of the Harrier, which made its first vertical take-off in 1960. A clear line of development can be traced throughout its design. The P1127 prototype is on display at Brooklands Museum, Weybridge, together with a Hunter and a replica Hurricane. More of a perfectionist than an innovator, Camm's designs evolved logically, progressively and successfully from each other. Although Camm started his career without any advanced scientific training, he had a masterful eye and an intuitive feel for a well-designed aeroplane. Endowed with these rare gifts he produced a succession of aircraft that were not only extremely good-looking but also boasted excellent performance and handling characteristics. 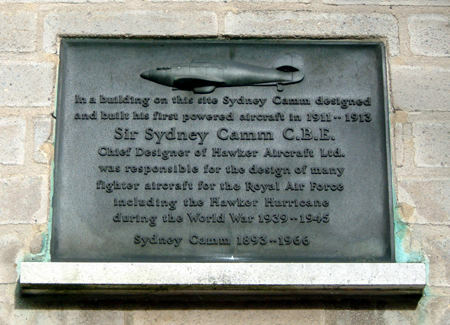 Sydney Camm, acclaimed by Sir Thomas Sopwith as being the greatest designer of fighter aircraft the world has known, received the British Gold Medal for Aeronautics in 1949, was elected President of the Royal Aeronautical Society in 1954 and received its highest honour, the Gold Medal, in 1958. 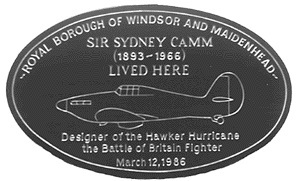 Sydney Camm was knighted in 1953. In 1966 Sir Sydney Camm was awarded the Guggenheim Gold Medal, the leading American aeronautical award, which had to be presented posthumously. He died in 1966 at the age of seventy-two. Sir Sydney once said, "The main requirements of an aircraft designer were a knowledge of aerodynamics, some elementary maths, and an eye for beauty." He had a sharp eye for picking out a poor piece of design. His comments such as 'struts like floorboards' were long remembered. His dedication to aircraft design was to last over 50 years, a dedication that lead to his being knighted, the award of the Gold Medal and Honorary Fellowship of the Aeronautical Society and the Daniel Guggenheim Medal in 1965 - an honour that he heard of shortly before his death in 1966. The plaque illustrated above was originally unveiled in 1986 on No 10 Alma Road, Windsor, but has since been removed, probably stolen. In 2007 plans are well advanced to erect a Hurricane replica in Windsor by way of a memorial.